I’ve been to Maui once before for my 30th birthday with family. Honestly, it wasn’t my favorite Hawaiian island (I’ve been to Oahu and Kauai as well). We stayed in one area though on that first trip and really just hung out on the beach so I had no idea how much Maui had to offer. My traveling companion had never been to Hawaii and he’s quite adventurous so we had a blast discovering all the nooks and crannies of the island together. We drove every mile of every major road, hiked, snorkeled, road a dirt bike, swam in the ocean under the stars…it was magical and I completely fell in love with Maui. Needless to say I am suffering from a little post-vaca depression now. 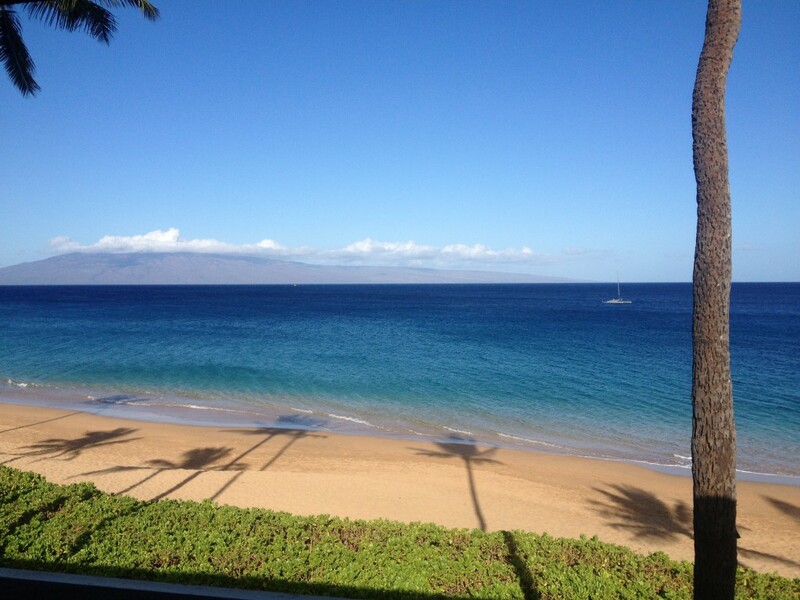 View from our oceanfront room. Anyway, the important thing here is the food – OH MY GOD THE FOOD! I always do a ton of research before traveling to find places that are vegan friendly and I came up with a pretty solid list, but as most travel goes I had to go with the flow and missed a lot of the restaurants I wanted to check out. But that’s totally okay because I found pretty amazing food in every town we visited. Maui has a TON of little health markets which made life easy and we even found a veg-friendly Mexican restaurant! Check out the video below for the scoop and the list of places linked at the end of this post. Aloha! Veggie wraps & bagels, vegan soups & cupcakes, smoothies. Soy, rice & almond milk for coffee drinks. Natural Grocery Store – stocked up on a ton of staples for the week here! Tofu & veggie wraps & curries. Build your own pancakes & cook right at your table – they offer GF/Vegan batter!! Fresh fruit toppings like shredded coconuts, Kula strawberries, blueberries, etc. Would be a blast for kids! Had dinner here for a wedding reception. The menu isn’t incredibly veg friendly, but they made me a wonderful vegan meal. Maybe if you call ahead they would prepare something for you! This place offers lard free refried beans, vegetarian rice, tofu and Texturized Vegetable Protein. Plus – margaritas! Beware though, their guac has sour cream, but they will give you fresh avocado as a replacement! A couple great vegan options, located in an office complex but open on the weekends. Organic family farm with fresh fruit and coffee. Right on the beach in Whaler’s Village. Offers an awesome vegan burger, plus yummy tropical cocktails. Smoothies, Açaí bowls, vegetarian hot bar and health food store. Restaurants I didn’t get a chance to go to but were on my vegan friendly list (I guess I’ll just have to go back! ): Fresh Mint, Veg Out, Coconut Glens, Joy’s Place & South Shore Tiki Lounge.